The ADMM-Plus meeting in Kuala Lumpur, Malaysia (November 4, 2015). Singapore and Vietnam’s joint proposal has broad support among ASEAN states and Plus members. In 2018, Singapore will assume the ASEAN Chairmanship, a major responsibility in an increasingly uncertain region. 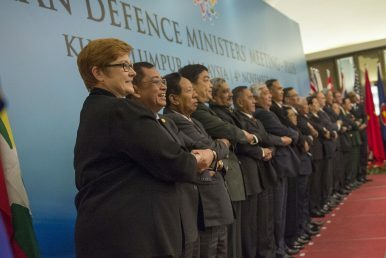 One of Singapore’s responsibilities is the chairmanship of the ASEAN Defense Ministers’ Meeting (ADMM), the annual meeting of ASEAN defense ministers, as well as the ADMM-Plus, which also includes the defense ministers of eight other extra-ASEAN countries, which are ASEAN’s dialogue partners. Established in 2010, the ADMM-Plus now convenes biennially, although it met once every three years when it first began. As Singapore prepares to take on the ASEAN Chairmanship, much work is already underway to prepare the Republic for this important responsibility. One proposal that Singapore has already raised is the annualization of the ADMM-Plus. During the Shangri-La Dialogue in 2017, Singapore’s defense minister, Dr. Ng Eng Hen, announced that both Singapore and Vietnam have “jointly proposed for the ADMM-Plus to be annualized from 2017 onwards.” This will be a momentous movement forward for the ADMM-Plus, as it will demonstrate the political commitment of ADMM-Plus members to meet every year and ensure that discussions remain up-to-date. An ADMM-Plus that only meets once every two or three years would less effectively respond to developments occurring in between meetings. The annualization of the meeting also demonstrates the recognized importance of the ADMM-Plus in fostering regional defense diplomacy and security, and the proposal by Singapore and Vietnam could not have been more timely. It also underscores how strategic Singapore and Vietnam are in driving a proposal that is likely to push the ADMM-Plus to new heights and levels of legitimacy, and is expected to be warmly welcomed by the other ADMM-Plus defense ministers. It also demonstrates Singapore’s thought leadership as it prepares to assume the ASEAN Chairmanship next year. As the only ASEAN platform that hosts defense ministers of ASEAN and dialogue partner countries, the main aim of the ADMM-Plus is to enhance regional security by promoting confidence-building between ASEAN and dialogue partner defense establishments. This is important for three reasons. First, the ADMM-Plus facilitates dialogue between ASEAN defense ministers and their Plus counterparts, enabling both sides to discuss defense and security issues in a common platform. This is particularly crucial given the increasingly uncertain geopolitical dynamics in a region beset by territorial disputes and great power rivalry, as well as non-traditional security issues such as natural disasters, and the threat of terrorism and cyber attacks. There are nonetheless concerns about the level of unity within the ADMM-Plus. Even though the third ADMM-Plus failed to conclude a Joint Declaration due to a lack of agreement on the South China Sea issue in 2015, the Malaysian chair issued a Chairman’s Statement instead, a document that did not require the consensus of all the parties involved in the meeting. This at least partially salvaged any perception of unity that might have been thrown into doubt during the third ADMM-Plus. Singapore’s Ng had also mentioned that the failure to reach consensus on certain issues may not necessarily be negative, as it demonstrates that the ADMM-Plus is maturing as a platform and countries are able to discuss and debate issues freely, and even disagree with each other. Still, moving forward, the ADMM-Plus will need to ensure that unity, or some semblance of unity, is maintained, a task that will require adroit chairmanship. Second, the ADMM-Plus enhances practical and functional military cooperation in the region. Over the years, ADMM-Plus has seen positive trajectory in promoting regional cooperation. This is exemplified by the Experts’ Working Groups (EWGs), which were set up to facilitate cooperation between ASEAN countries and dialogue partners in specific functional areas. In 2013, the ADMM-Plus began adding to the existing EWGs by establishing the EWG on Humanitarian Mine Action. Further to this, a new EWG on Cybersecurity was established in 2016. For several years, threats to cybersecurity have been mounting, and cybersecurity has increasingly been on the agenda of national governments and defense establishments. The inclusion of cybersecurity as a major concern at the ADMM-Plus level demonstrates that the ADMM-Plus continues to remain up to date in addressing emerging security challenges and maintains its importance as the premier defense cooperation platform in the region. The ADMM-Plus EWGs have hosted many high-profile exercises. In 2016 alone, as many as four exercises were held, including the largest exercise to date, the Maritime Security and Counter-Terrorism (MS&CT) Exercise held in Brunei and Singapore in May 2016. These exercises are useful not only in promoting interoperability among the participating militaries and enhancing capacities, but they also further enhance personnel-to-personnel relations among the militaries at both the strategic level and operational level, providing a channel of communication that will be useful for defusing a crisis should one develop. Beyond these, exercises also serve as a salient reminder that practical cooperation can continue despite political differences on specific issues. For instance, the Philippines and China cooperated well together during the MS&CT Exercise in May 2016 despite the impending ruling by the Arbitral Tribunal on the Philippines vs. China case involving the South China Sea. Another example was the ADMM-Plus HADR and Military Medicine Exercise in June 2013, which saw U.S., Chinese, and Japanese military personnel work side-by-side despite ongoing tensions in the East China Sea. Third, the ADMM-Plus also can serve to facilitate capacity-building among the militaries of ASEAN countries. With the aforementioned exercises and dialogues, there exist opportunities for the ASEAN militaries to further sharpen their capacities through a “learning-by-doing” process. Moreover, with the involvement of the Plus countries, ASEAN countries can also observe and learn from the Plus countries — recognized for their greater level of military capabilities — during exercises and other engagements. There is keen appetite among the ADMM-Plus countries for an annual ADMM-Plus meeting. A series of interviews with current and former defense and military officials, Track II representatives, and academics in ASEAN states and Plus countries generally illustrated enthusiasm for greater institutionalization of the ADMM-Plus. One of the major suggestions that recommended during the interviews was for the ADMM-Plus to be held annually, rather than biennially as is currently the case, while others indicated that the increasing frequency of the ADMM-Plus has been a positive development. Nonetheless, some indicated that a potential challenge is the lack of resources, particularly human resources, of some ASEAN member states to participate in an annual ADMM-Plus, together with all the meetings and exercises each year. Such a situation could be addressed by cutting down the number of minor meetings that have duplicated functions with other meetings or are no longer relevant, and instead focusing on the major meetings. Countries could also consider merging some of the EWGs, or combining EWG activities. For example, more combined exercises involving two or more EWGs could be held, which would significantly reduce the troop and asset commitments compared to holding many separate EWG exercises. As such, even though individual state resources cannot be enhanced overnight, the ADMM-Plus can be made more efficient. The current Philippine chair already appears to be doing so – this year, only 10 events had been planned for the ADMM and ADMM-Plus calendar for 2017, as compared to 21 events in 2016, and 25 in 2015. As Singapore prepares to assume the ASEAN Chairmanship in 2018, its joint proposal with Vietnam to increase the frequency of the ADMM-Plus to an annual meeting is a timely proposition that would find support among the ASEAN and Plus countries. This will further enhance the dialogue among the regional defense chiefs, even if the forum still has to address challenges that are by no means insurmountable. ASEAN’s First Naval Exercise in PerspectiveWhat Did the ASEAN Defense Meetings in the Philippines Achieve?ASEAN Defense Chiefs Agree to New Cybersecurity GroupASEAN Launches New Military Medicine CenterWhat Did the 3rd ASEAN Defense Minister’s Meeting Plus Achieve?